ELUSA-SWSLoo, Inc. is very proud to notify our customers that we are now offering 4 models of the Enviro Loo no infrastructure toilets - all MADE IN AMERICA. Our models are the R-15 Residential Model, the R-30 Residential Model; the C-60 Commercial Model; and the I-100 Industrial Model. These cutting edge models require no infrastructure - no water, no electricity, no chemical and no additives. Golf Courses are a new target market for Enviro Loo USA/SWSLoo's product, the Enviro Loo (Eloo). With the expanding and demanding recreational industry, the Eloo meets many of the requirements of today's recreational user/member by providing environmentally friendly, low maintenance, sustainable human waste management systems. 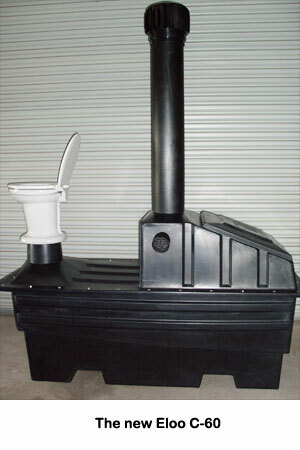 The Eloo (Enviro Loo) does not require infrastructure: no water, no electricity or generated power, and no chemicals. The ELOO® operates by separating the liquid and solid waste. This waste is subjected to ambient heat and directed airflow to achieve the necessary dehydration and evaporation to convert this waste, with ancillary bacterial and biological activity, into the dried, ashlike material which is approximately 5-10% of its original mass (solid waste). The liquid waste totally evaporates. Installation of the The ELOO® should be with the back of the unit placed to collect the most sunlight and heat - the solar window in your hemisphere. The heat build-up (radiant heat) is absorbed through the UV-protected black polyethylene plastic of the maintenance cover and vent pipe. The increased internal temperature causes convective airflow which adds to the airflow through the intake pipes. Depending on the climatic conditions where the The ELOO® is installed, additional solar fans may be added to the unit to increase air flow. Local state regulations may require a high-water alarm be placed in the ELOO®. SWSLoo™ provides a choice of solar or battery alarms, either audio or visual or both, to meet state and/or county requirements. Testing of the The ELOO® indicates that the evaporation and dehydration processes continue working until the interior temperature of the unit reaches a low of 1 degree farenheit, which means that the Eloo will continue to operate in most climatic conditions in a very large range of temperatures. .